Why tumors become resistant to chemotherapy? A common observation in oncology is the phenomenon that a patient with a tumor receives a drug and responds very well, but after a few months the cancer comes back and is now resistant to previously administered chemotherapy. What happened? Many mechanisms contribute to explain this effect called "acquired resistance", but today the group Manel Esteller, Director of Epigenetics and Cancer Biology at the Bellvitge Biomedical Research Institute (IDIBELL) , ICREA researcher and Professor of Genetics at the University of Barcelona, describes in the official Journal of the National Cancer Research Center in the United States , The Journal of The National Cancer Institute, the existence of epigenetic differences that explain the lack of response of the tumor recurs. "We studied colon cancer cells that were initially sensitive to oxaliplatin drug and then became insensitive to this drug and we found that resistant tumors had inactivated a gene (SRBC) in their DNA" says Manel Esteller "the loss of activity supposedly happens in a gene involved in DNA repair. Thus these tumor cells, when receiving the drug, quickly repair the effect thereof and do not die. Studying nearly two hundred patients with colon cancer also found that inactivation of the gene is associated with poorer survival of these people despite treatment. Interestingly the loss of function of this gene could also explain why some colon tumors are resistant from the outset, what is known as "primary resistance " concludes Esteller. This is a microscopic image of a colon cancer. 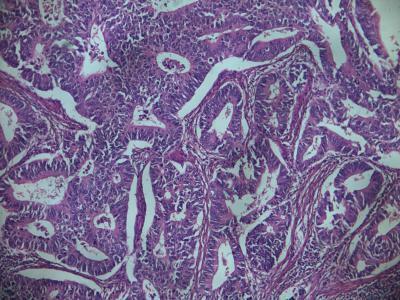 The discovery could have important implications for personalized treatment of colon cancer. If these findings extend to other clinical trials, determining the activation state of the SRBC gene could be useful in deciding whether a patient should receive a type of drug or another. Likewise the use of another class of drugs that return gen activity (epigenetic drugs) could restore the sensitivity to the original drug , oxaliplatin . Finally, a very promising door is opened to examine whether similar mechanisms are happening in other human tumors beyond colon cancer.